One machine for all your juicing needs! The Juice man Power Plus Compact Juicer with Citrus Attachment extracts flavorful, nutritious juice from berries, veggies, leafy greens, AND citrus, in no time. 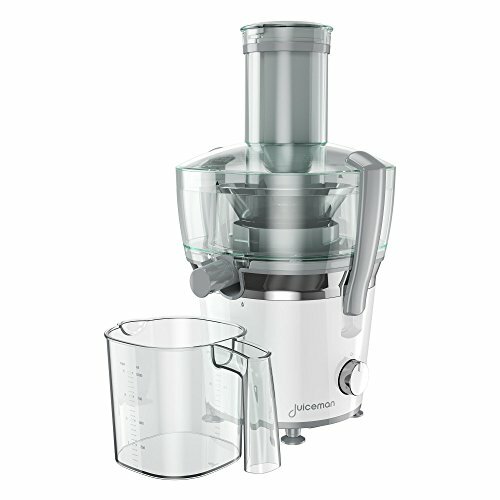 The 800-watt motor powers the stainless steel mesh filter to make quick work of produce, funneling delicious juice into the included pitcher and separating pulp for disposal or use in other recipes. High and low speeds maximize juice extraction, and the included juicing cones let you create fresh orange juice or lemonade anytime. Plus, the compact, all-in-one design saves space on your counter-top so this powerful juicer can become an everyday part of your kitchen. Lock the latches by holding down the cover fitting the top of the latches into the tabs on each side of the lid. Press the bottom of each latch inward until they click into place.